Services - Nutri-Ject Systems, Inc.
Nutri-Ject Systems, Inc. is the largest biosolids contracting firm in the upper Midwest. With offices in Hudson, Iowa and Junction City, Kansas, we can provide biosolids management programs throughout the Midwest. 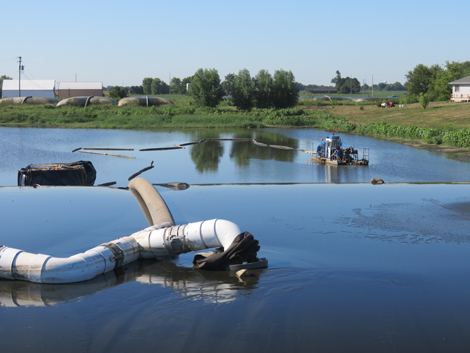 Nutri-Ject systems uses state of the art low turbidity dredges capable of dredging your wastewater lagoon, water treatment lagoon, golf course pond, lake, boat harbor or industrial settling pond with minimal effect and no elevation of your total suspended solids in your discharge. In the event a lagoon is down for service and needs to be taken off line, our Caterpillar LGP (Low Ground Pressure) dozer is often times used. Our patented push bar system squeegees the material without damaging the integrity of the lagoon liner. The material is then moved to a tractor PTO driven lagoon pump and then loaded on to tankers or applicators for final transportation and application on the respective farm fields. Nutri-Ject employees all carry the 10 hour OSHA certification and have extensive training in confined space entry procedures, which comply with all OSHA confined space regulations pertaining to the cleaning of anaerobic and anaerobic digesters. Nutri-Ject can provide for the complete insulation and repair of either floating or submerged fine diffused aeration systems. Our equipment is capable of replacing membranes and polyethylene supply piping without the dewatering of the lagoons. Nutri-Ject has the capability of meeting all of your long term and emergency Dewatering needs in the event of plant failures or capacity issues. We can provide portable belt filter presses up to 2 meters and have an extensive background in dewatering through the use of Geotube Containers. Nutri-Ject has a well maintained fleet of semi tractor trailer units and 6000 gallon leak proof tankers to transport biosolids up to 20 miles from your waste water treatment plant to the respective field site and final application. Our dry cake division transports all belt filter cake material from 18-25% solids through the use of SmithCo 35 Cubic Yard side dump trailers. Our trailers are equipped with electric roll tarps to assure there is no spillage on roads and highways to the respective field application sites. Let us take the hassle out of your residuals management. From the Plant out, including all analysis, land procurement, soil testing, land application at proper agronomic rates, determined soil tests and crop needs, public relations as well as all regulatory correspondence and development of your annual State or EPA report, we have you covered. We have applicators capable of applying up to 500,000 gallons of liquid biosolids per day or 300-500 wet tons of dry biosolids per day. Our applicators are mounted on track vehicles and floater type vehicles. Our highly trained and educated staff is happy to give you a cost estimate on any project. We will work 24 hours a day, 7 days a week to complete our projects in a timely and environmentally safe fashion to the customer’s 100% satisfaction. Let our staff help you with procurement of land and your agronomic loadings. We provide all final field reports upon completion of every project to keep you in compliance with State regulators, the EPA, and Federal 503 regulations.